This page provides an overview of recent and forthcoming publications and projects by members of CRECS. Bill Bell, Innes Keighren and Charles Withers, Travels into Print: Exploration, Writing and Publishing with John Murray, 1773–1859 (Chicago University Press, 2015 forthcoming). 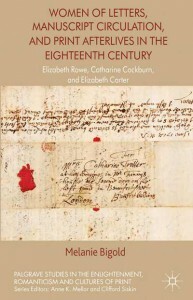 Melanie Bigold, Women of Letters, Manuscript Circulation and Print Afterlives in the Eighteenth Century: Elizabeth Rowe, Catharine Cockburn and Elizabeth Carter (Palgrave, 2012). Anthony Mandal (ed. ), Self-Control: A Novel, by Mary Brunton (Pickering & Chatto, 2014). Anthony Mandal and Brian Southam (eds), The Reception of Jane Austen in Europe, new edn (Bloomsbury, 2014). Jane Moore (ed. ), Mary Wollstonecraft, International Library of Essays in the History of Social and Political Thought (Ashgate, 2012). Damian Walford Davies, Cartographies of Culture: New Geographies of Welsh Writing in English (University of Wales Press, 2012). Damian Walford Davies, Mererid Hopwood and Paul White, Poets’ Graves / Beddau’r Beirdd (Gomer Press, 2014). Bill Bell, ‘One Great Confederation: English Tourists in Nineteenth-Century Europe’, in ‘Die Bienen fremder Literaturen’: Der literarische Transfer zwischen Großbritannien, Frankreich und dem deutschsprachigen Raum im Zeitalter der Weltliteratur, 1770–1850, ed. by Norbert Bachleitner and M. G. Hall (Harrassowitz, 2012). Bill Bell, ‘”Think on these things”: The Reading Subject in 19th-Century Missions’, in Construction of the Other, Identification of the Self: German Mission in India, Studien zur Orientalischen Kirchengeschichte, vol. 45 (LIT Verlag, 2012). Bill Bell, ‘Signs Taken for Wonders: An Anecdote Taken from History’, New Literary History, 43 (2012). Bill Bell, ‘Authors in an Industrial Economy: The Case of John Murray’s Travel Writers’, Romantic Textualities: Literature and Print Culture, 1780–1840, 21 (Winter 2013). Melanie Bigold, ‘”Theatre of the Book”: Marginalia and Mise-en-Page in the Cardiff rare Books Restoration Drama Collection’, Cardiff Book History blog (Dec 2013). Melanie Bigold, ‘George Ballard’s Memoirs of Several Ladies and “bookmaking out of the remains of the dead”‘, Eighteenth-Century Life (forthcoming). James Castell, ‘Wordsworth, Silence and the Nonhuman’, Wordsworth Circle, 45.1 (2014). James Castell, ‘William Wordsworth’, in The Oxford History of Classical Reception in English Literature, 1780–1880 volume, ed. by Norman Vance and Jennifer Wallace (OUP, 2015 forthcoming). James Castell, ‘Wordsworth and the Life of Things’, in The Oxford Handbook of William Wordsworth, ed. by Richard Gravil and Daniel Robinson (OUP, 2015 forthcoming). Sophie Coulombeau, ‘“Men whose glory it is, to be known”: Godwin, Bentham and the London Corresponding Society’, Nineteenth-Century Prose, 41.2 (Fall 2014). Sophie Coulombeau, ‘”Fill up his blanks”: Making Matthew Montagu’, Huntington Library Quarterly (2015 forthcoming). Anthony Mandal, ‘Gothic and the Publishing World, 1790–1830’, in The Gothic World, ed. by Glennis Byron and Dale Townshend (London and New York: Routledge, 2013). Anthony Mandal, ‘Publication History’, in The Cambridge Companion to ‘Pride and Prejudice’, ed. by Janet Todd (Cambridge: CUP, 2013). Anthony Mandal, ‘Two Centuries of Pride and Prejudice: Why Celebrate?’, in ‘Pride and Prejudice’: A Bicentennial Bricolage, ed. Caterina Colomba (Udine: Forum, 2014). Anthony Mandal, ‘Fiction’, in The Cambridge Companion to Women’s Writing in the Romantic Period, ed. by Devoney Looser (CUP, 2015 forthcoming). Anthony Mandal, ‘Evangelical Fiction’, in The Oxford History of the Novel in English, Volume 2: 1750–1820, ed. by Peter Garside and Karen O’Brien (OUP, 2015 forthcoming). Anthony Mandal and Keir Waddington, ‘The Pathology of Common Life: “Domestic” Medicine as Gothic Disruption’, Gothic Studies, 17.1 (May 2015 forthcoming). Jane Moore, ‘Nineteenth-Century Irish Anacreontics: The Literary Relationship of James Clarence Mangan and Thomas Moore’, Irish Studies Review, 21.4 (2013). Jane Moore, ‘Modern Manners: Regency Boxing and Romantic Sociability’, Romanticism 19.3 (2013). Jane Moore, ‘Thomas Moore, Anacreon and the Romantic Tradition’, Romantic Textualities: Literature and Print Culture, 1780–1840, 21 (Winter 2013). Damian Walford Davies, ‘Capital Crimes: John Thelwall, “Gallucide” and Psychobiography’, Romanticism, 18.1 (2012). Damian Walford Davies and Tim Fulford, ‘Romanticism’s Wye’, Romanticism 19.2 (2013). Anthony Mandal (ed. ), Romantic Textualities: Literature and Print Culture, 1780–1840, 21 (Winter 2013): ‘Romantic Visual Cultures #1’ (special issue).